I use a Brother GS2510 and my machine build/ layout may be different to your own however the functions of most sewing machines are the same. 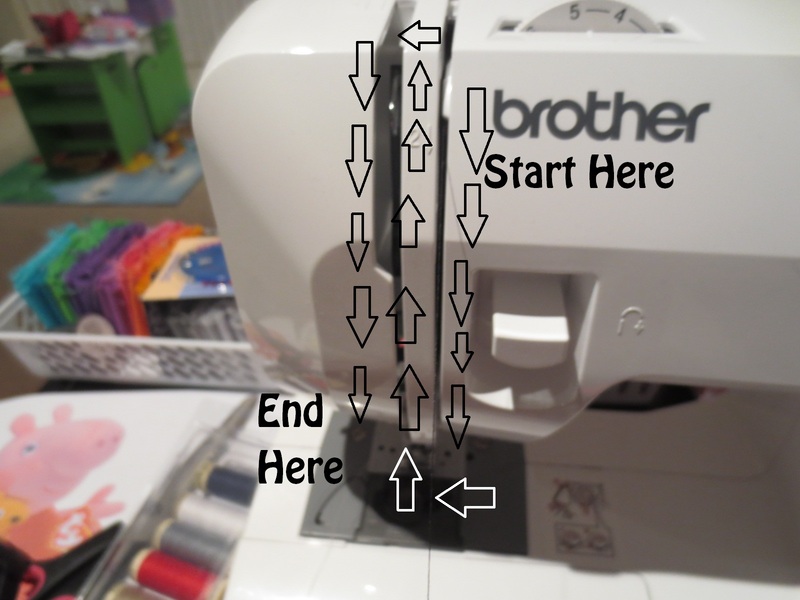 I am lucky enough to have clear diagrams on my machine for how to thread both a bobbin and/ or needle, but even without these diagrams the method is rather simple and similar on most machines. To thread the bobbin we will be using this method illustrated here on the machine. Loop the thread around the top of the thread holder and making sure you are still able to pull the thread freely. The bobbin will have two holes up the top and bottom and also a groove in its middle so it is able to be 'held into place once put on its holder, you need to thread the cotton underneath the top hole and pull it upwards as shown in the picture below. Once the cotton is poking through the hole of the bobbin, still holding the cotton thread place the bobbin onto the bobbin holder. Still with the thread between your fingers, push your bobbin holder to the right hand side until you hear a click (or similar noise) this is the bobbin holder locking into place. While you are holding the thread and the bobbin holder is now in place, make sure your machine is on and apply slight pressure to the foot pedal. The bobbin will start to spin, and as it does the thread will transfer onto the bobbin. Once there is enough thread you will no longer have to hold the top piece as it'll be held securely by the winding thread. Once your bobbin is full you will notice it beginning to turn much slower then it did at the start, now you simply take your foot off the foot pedal, snip the long thread running from the thread holder (leaving about 4-5 cms) push the holder back to the left and remove your fully threaded bobbin from your machine. I wasn't able to get any pictures of the bobbin complete with the thread unfortunately however I will later update this post with additional photos. I find if I have some free time when sewing, I will thread colours I use a lot such as; black, white, cream, blue and/or grey onto spare bobbins which saves me later on from having to do so. Place your thread onto the spool pin and begin pulling the end of the thread to your thread holder, the same guide we used to thread our bobbin, however unlike looping around the guide as we did for the bobbin, we are simply following the thread downwards. I tried to make it easier below by including arrows...and hopefully you understand the point, and aren't overwhelmed by the arrows. 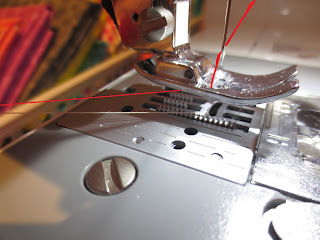 With your needle up, there will be a metal hook (as shown slightly in the below picture) that you will need to loop your thread around, once you have done this continue downwards on the thread guide. To make the thread easier to see, I quickly went over it in Microsoft Paint so I hope this helps to get the idea of how the needle threader operates. This is demonstrating the small hook pulling your thread through the eye of the needle. 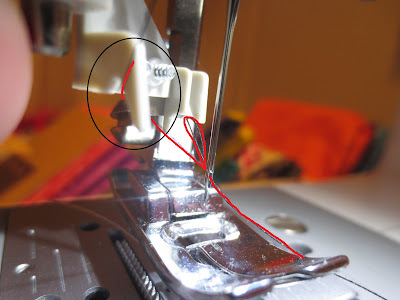 Pull the thread back about (3-4 cms) to avoid the machine pulling out your thread off your needle upon starting to sew, I have again highlighted the thread in red to make it easier for your viewing. Congratulations! You have now successfully threaded a bobbin and your machines needle. Also please feel free to pin this for easy reference to, or even for someone else.